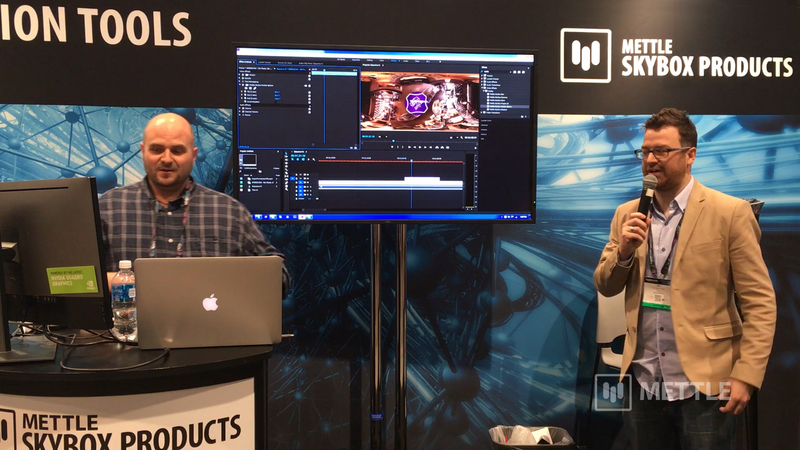 Introducing SkyBox Studio, the most complete set of tools available for 360/VR Production in After Effects. We have added 2 more modules to SkyBox, which make it easy to import your stitched 360 footage and work/preview in After Effects. 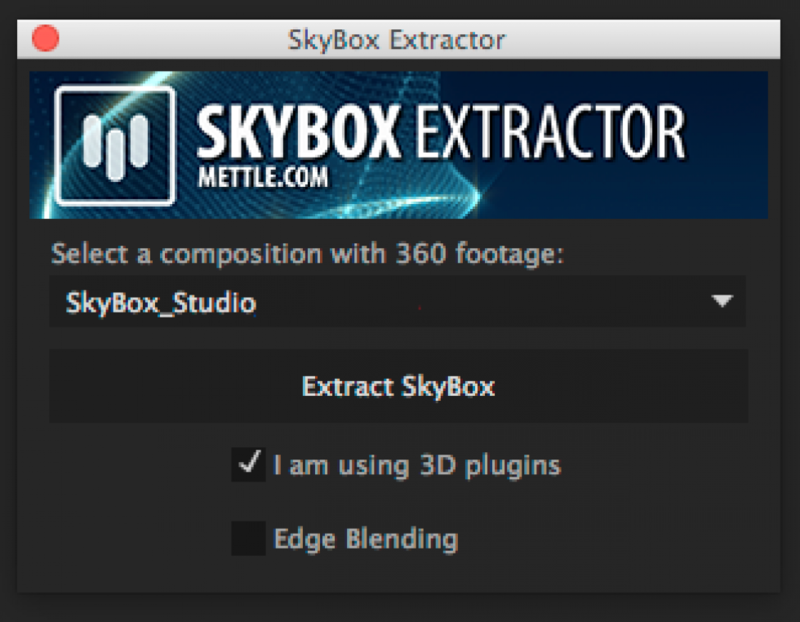 SkyBox Extractor is a new module that will “Extract” a flattened cubic cross format from your stitched 360 footage so you can easliy add text, logo, do compositing, motion tracking and object removal. 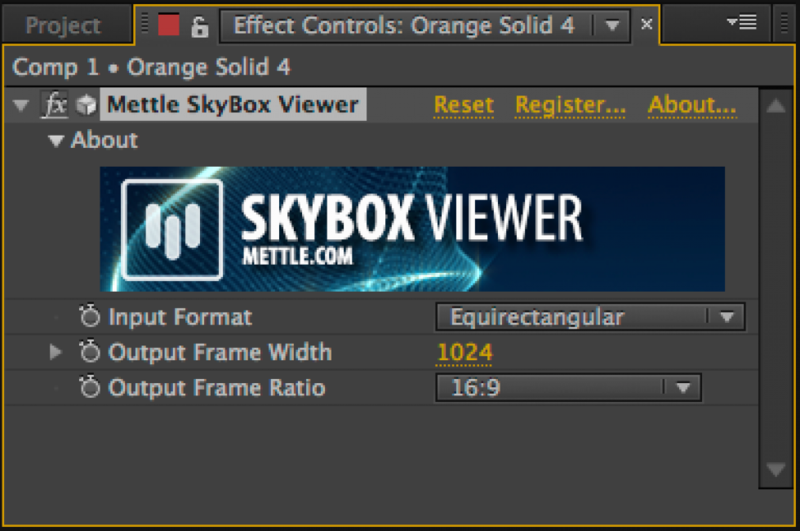 SkyBox Viewer is a new module that lets you preview your work in After Effects. 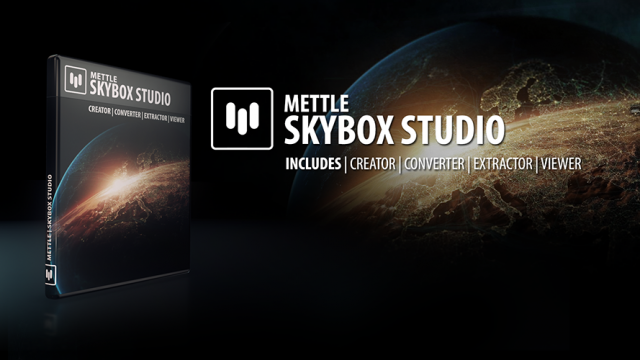 SkyBox Studio works within After Effect’s 3D space and with most Ae 3D plugins, including mettle ShapeShifter Ae, FreeForm, FreeForm Pro, Trapcode Particular and Form, Element 3D, Plexus, and others. 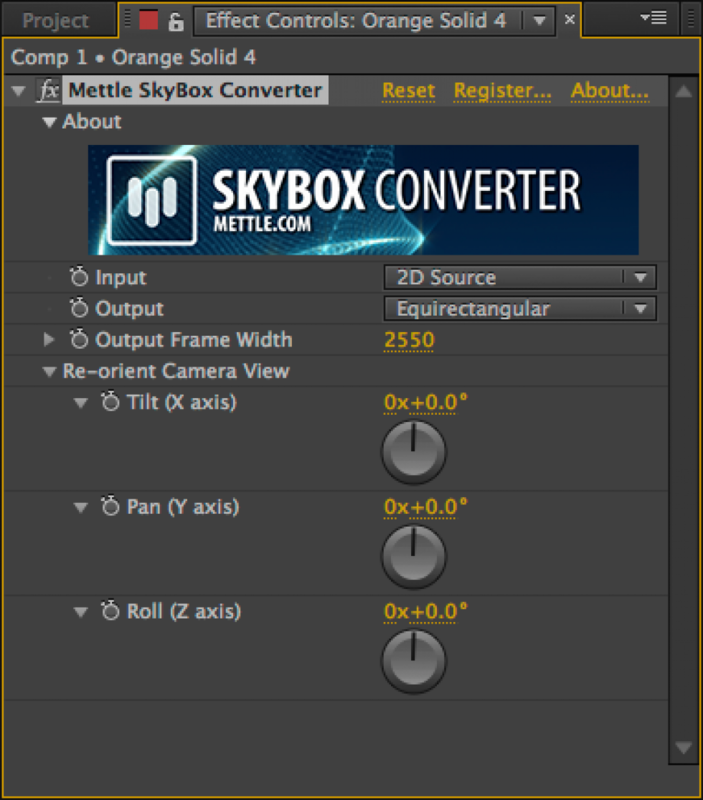 SkyBox Creator is a script module that lets you generate 360/VR from your After Effects comp. 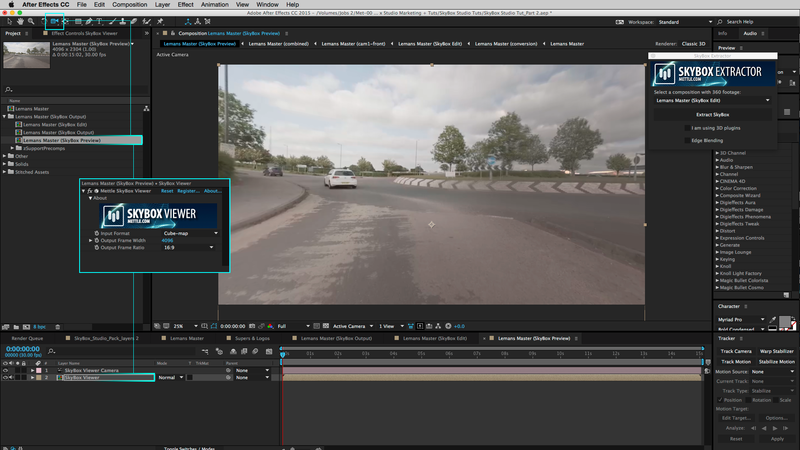 It automatically places a Camera with 6 views in your comp, to generate the output. And you can update your comp and refresh the output. 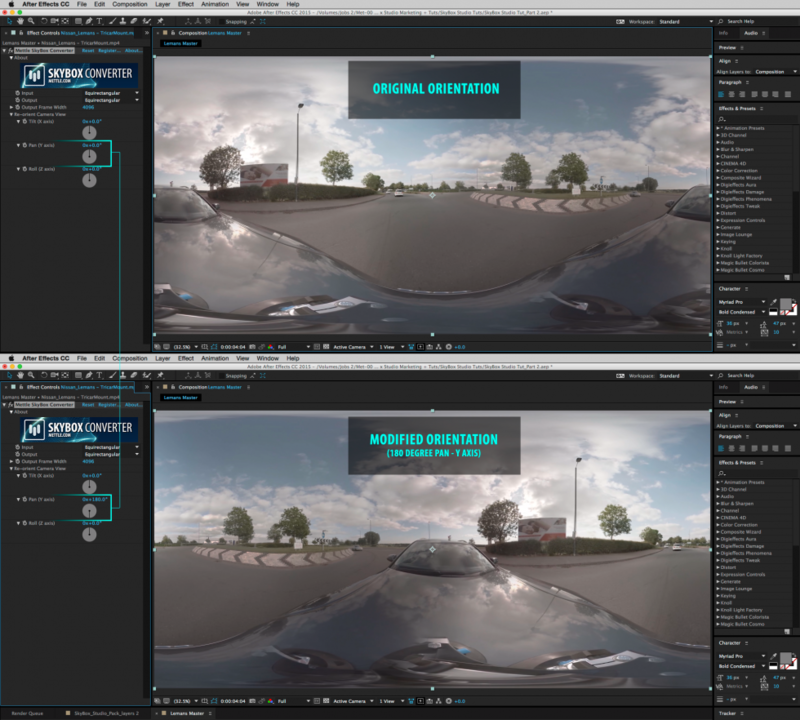 SkyBox Extractor is a script module that converts stitched 360 footage into 6 separate camera views, where you can motion-track, do object removal, add motion-graphics, vfx etc. 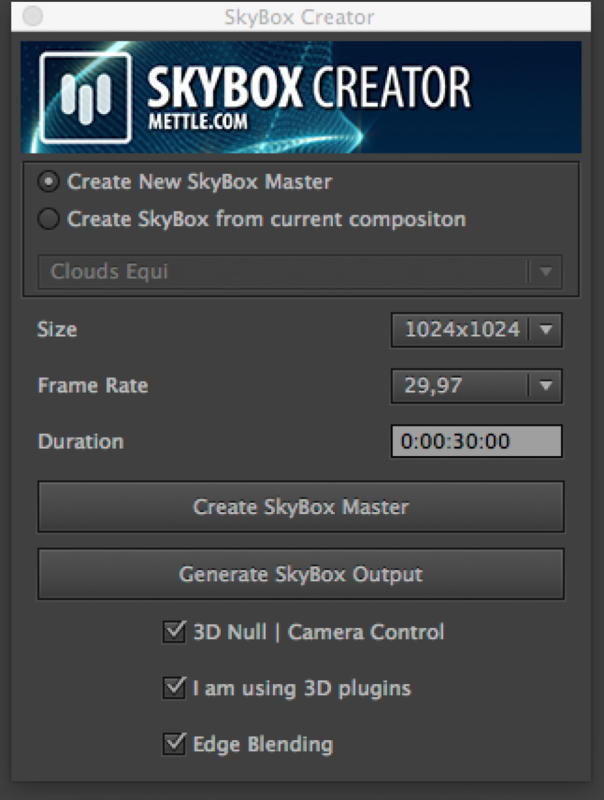 SkyBox Viewer is a plugin module that emulates what you will see in youtube 360, Oculus Rift and other formats. This is excellent for pre-flight testing of your composites and animations. SkyBox Extractor: Takes stitched 360 footage > adds a Master SkyBox Camera as well as 6 more camera views that are parented to the Master Camera. 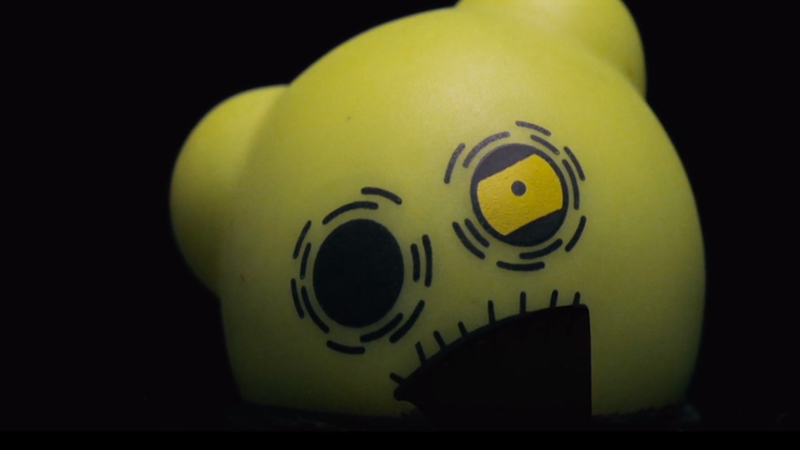 Generates 6 “Faces”… Front, Right, Back, Top, Left & Bottom, exactly positioned to form the cube you see above. 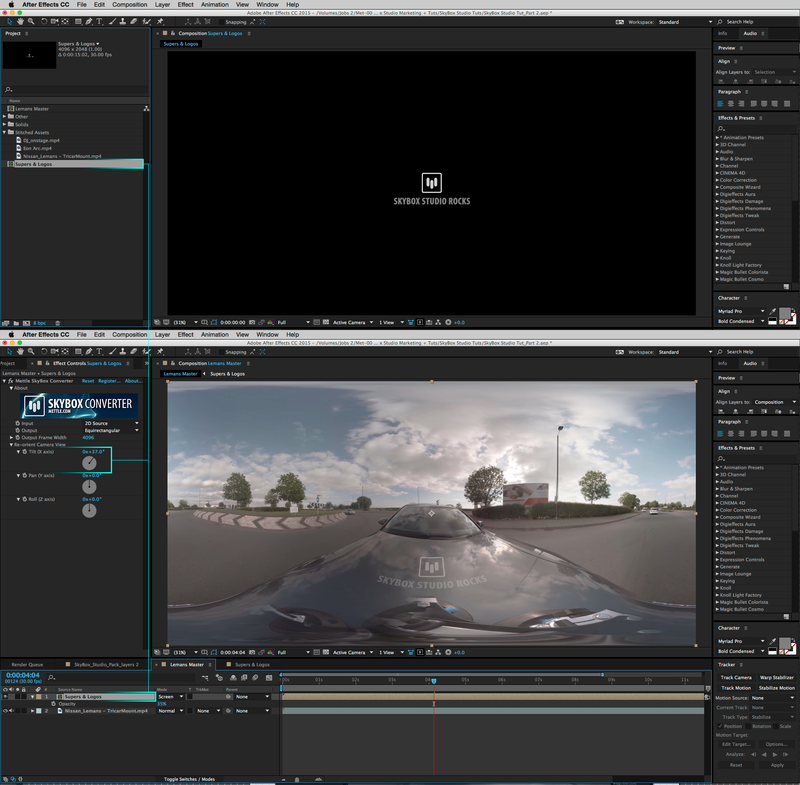 SkyBox Studio: Great for Rig removal. 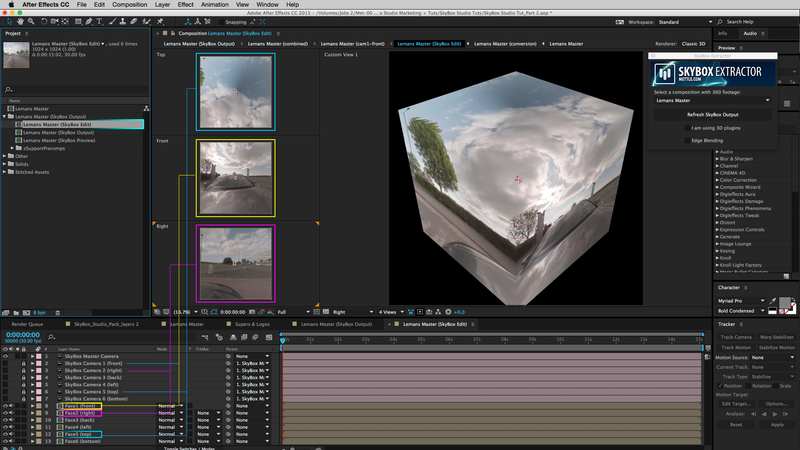 SkyBox Viewer. 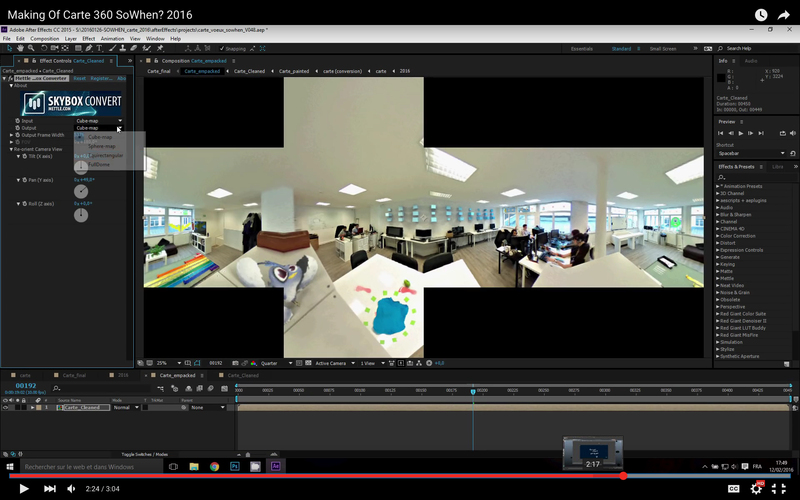 Preview your 360 output. 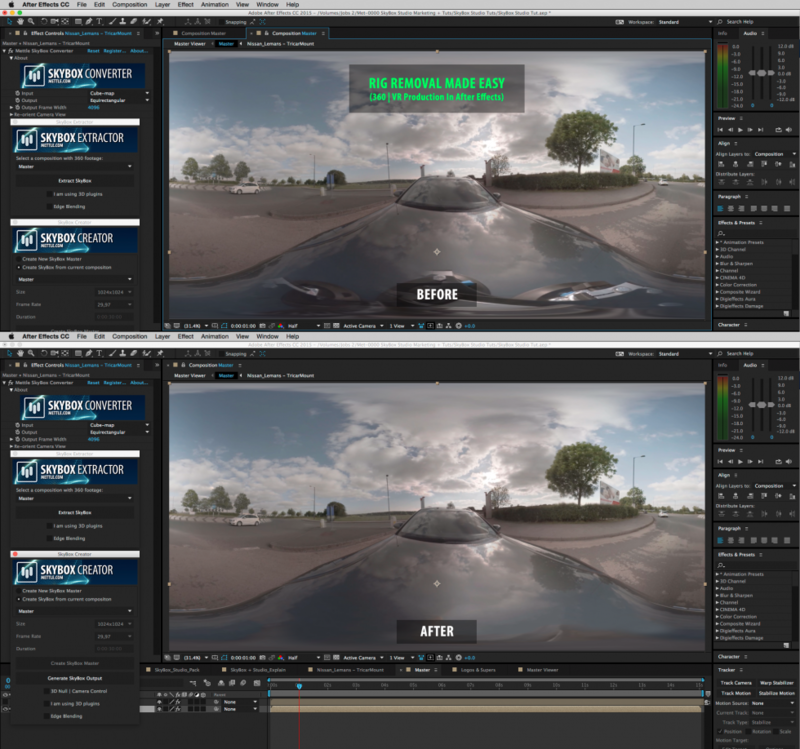 SkyBox Convertor > Re-Orient Camera. Tilt, Pan, Roll in 360. Convertor > Input 2D Source. An easy way to add a logo or watermark to 360 footage.